April at Bats, and August at The Blue Note Bar. Cast: Clare Kerrison, Christine Brooks, and Jen Mason, Anna Burns and Merrilee McCoy. The reviewer from Salient complained, “I laughed so hard I couldn’t see” and described the Angels as “a veritable squadron of wonderful”. 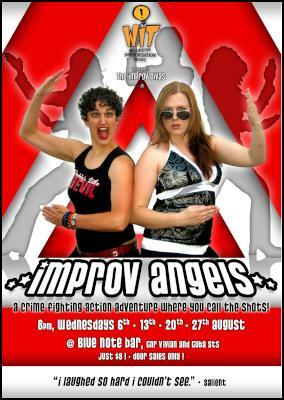 This entry was posted in Improv Divas, past shows and tagged comedy, Divas, improv, Improv Angels, improvatisation on August 6, 2008 by MaDmin.